Israel is widely considered to be one of the most advanced countries in Southwest Asia in both economic and industrial development. With a robust and growing economy, the country is a leading exporter of technology and pharmaceuticals, with the world's largest number of start-ups and NASDAQ-listed companies in the world outside of North America. Let's take a look at why international investors should consider investing in Israel and the best way to build exposure into their portfolios. Israel's economy began on a rough note, despite its success in the modern day. After achieving independence in May of 1948, the country faced a deep economic crisis thanks to the devastating 1948 Arab-Israeli War. The three billion marks paid by Germany to Israel for the persecution of the Jews during the Holocaust helped offset these losses in the 1950s. After the troubles in the 1940s and 1950s, the economy enjoyed strong economic growth rates until the bank stock crisis in 1983 that led to annual inflation rates close to 450% and projected to move over 1,000% by 1985. The country successfully implemented an economic stabilization plan in 1985 that paved the way for rapid growth in the 1990s. Israel's economy may not be the largest in the world by gross domestic product (GDP) - at about $340 billion in 2017 - but it's a world leader in software, telecommunication, semiconductors, and pharmaceuticals. With the world's largest number of start-ups and NASDAQ-listed companies outside of North America, the country's economy is rapidly growing. 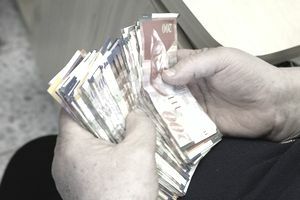 In addition to its strong economic growth rates, Israel's central bank has maintained a very successful monetary policy. The country ran a surplus of $60 billion in mid-2012, with an unemployment rate that remains lower than other developed countries, before the global economy slowed down. Meanwhile, its central bank has been ranked as one of the top in the world for maintaining stability. The easiest way to invest in Israel is by using exchange-traded funds (ETFs), which offer instant diversification in a single U.S.-traded security. With nearly $80 million in assets under management, the iShares MSCI Israel Capped ETF (NYSE: EIS) is one of the most popular options for investors looking for exposure to Israel's economy. While the ETF offers diversified exposure with 67 stocks in its portfolio, investors should consider the fact that approximately a third of the fund is exposed to the financial sector and nearly 20% is invested in Teva Pharmaceutical Industries Ltd. (NYSE: TEVA). The fund also has an expense ratio of 0.61%, which is roughly in-line with many other country ETFs. Israel's economy may be dynamic and growing, but the country faces many different risks that investors should consider. For instance, the country faces a number of geopolitical risks from other countries and financial risks from its large banking sector. Strong Startup Ecosystem. Israel is well known for its startup companies and strong venture capital industry, with many investors comparing it to Silicon Valley. Effective Central Bank. Many economies lose steam when central banks fail to act properly, but Israel has one of the best rated central banks in the world. Geopolitical Risk. Israel is positioned in one of the world's most volatile regions, where it's not uncommon for rockets to fly across its border. Political Policies. Israel has somewhat controversial political policies regarding Palestine and its tactics for dealing with Iran. Israel represents a strong investment opportunity in one of the most volatile regions in the world from a geopolitical standpoint. Investors looking for exposure can find many U.S.-traded ADRs - particularly on the NASDAQ - or may consider the iShares MSCI Israel Capped ETF (NYSE: EIS) as a more complete approach to building exposure into a portfolio.